Today, I got a letter from my ISP saying that they are giving everyone a free upgrade from 15mbps to 50mbps. As reported previously, without a VPN, I would get around 11-14mbps and after installing a VPN, I've been consistently getting over 30 mbps. Well, after this free upgrade, I tested with and without a VPN. With a VPN, it was coming in the 40mbps range. 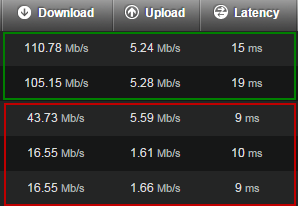 With the VPN, I'm consistently getting over 100mbps now. This is a nice Christmas gift from my ISP.